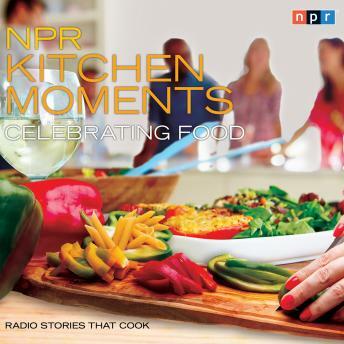 You're preparing to share the food you love with the friends and family that you love - while stories from NPR provide the inspiration. You're enjoying a Kitchen Moment. NPR celebrates the joyful, inspiring, and downright delicious culture of food with this smorgasbord of radio stories, featuring visits with celebrity chefs and famous foodies Gastón Acurio, Mark Bittman, Alton Brown, Julia Child, Amanda Cohen, Dana Goodyear, Dorie Greenspan, Jeff Henderson, Christopher Kimball, Maricel Presilla, Ruth Reichl, Marcus Samuelsson, William Sitwell and many others. This collection, both savory and sweet, is a veritable feast of unique and rewarding food stories, eating experiences and cooking insights that will capture the imaginations and whet the appetites of food lovers everywhere. Featuring: • Julia Child: An American, Forever in Paris • Ruth Reichl: Dining in Disguise and Going “Gourmet” • Alton Brown: Foodie Wannabe? Here's How to Fake It • Chef Jeff Henderson Collects Soul Food Through the Generations • Marcus Samuelsson: The Fight for the Right to Hear “Yes, Chef” and many more!